It is easy to learn how to play Chinese Checkers. It only has a few rules and they are easy to understand. Chinese Checkers makes a great board game for all players ages 7 and older. Chinese Checkers was introduced in the U.S. in 1928. It was originally called Hop Ching Checkers. It was based on an old German game called Stern-Halma. It was renamed Chinese Checkers shortly after it came to the U.S. to reflect the growing interest in oriental culture by Americans including the discovery of Kin Tut's tomb in 1922 and the introduction of the Mah Jongg game in 1923. Chinese Checkers is still called Halma in many European counties. It is easy to learn how to play Chinese Checkers. You can quickly get a game started because you only need to find one other player. A playing board - The board has a six-pointed star. Each point of the star is a triangle with ten holes. Each triangle is a different color and has ten holes (four holes to each side). The middle of the playing board is a hexagon. Each side of the hexagon has five holes. Marbles or pegs - There are six sets of marbles or pegs. Each set has ten marbles or pegs of a specific color. Some players prefer the peg version of the game because the pegs don't move if the board is accidentally bumped. Two players - Each player moves to the opposite triangle on the board. For a longer game, the each player can play two or three sets of marbles. Three players - Each player moves to the opposite triangle on the board. For a longer game, the each player can play two sets of marbles. Four players - Two pairs of opposing triangles are used. Each player moves to their opposite triangle. Five players - Four players move to the opposite triangle on the board. The fifth player moves to the unoccupied triangle. Six players - Each player gets a set of marbles and moves to the opposite triangle on the board. The goal of the game is to be the first player to move all ten of their marbles into the opposite triangle. The game moves quickly - it usually only takes about 20-30 minutes to play. The game starts by tossing a coin. The winner of the coin toss makes the opening move. Make one or more hops into a vacant hole. The moves can be in any direction over any adjacent marbles, including the marbles of the player who is taking the turn. The player can finish moving after one hop or can continue to hop over marbles as long as moves to vacant holes are available. The player can swap the opposing player's marble with their own marble. The game is won when a player has placed nine of their ten marbles in the destination triangle. 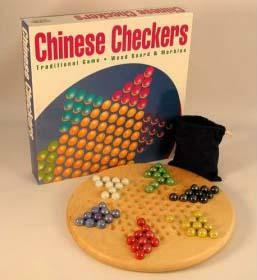 A fast-paced version of Chinese Checkers is called the "capture" version. This version is similar to traditional checkers. In the "capture" version, all marbles are placed in the center hexagon. The hole in the center is left vacant.Each player takes their turn by hopping over, and then removing, adjacent marbles on the board. The player with the most captured marbles wins the game.